While shopping for G's baby, I wanted to get her cute, yet functional, items. Practical things like blankets, clothes, burp cloths, etc. I fell in love with this blanket from Wild Dill called the "Swaddle Designs Organic Mod Circles Receiving Blanket". Perfect for swaddling, this award winning Organic Mod Circles Receiving Blanket by Swaddle Designs is an essential for every new parent and makes a great newborn gift. 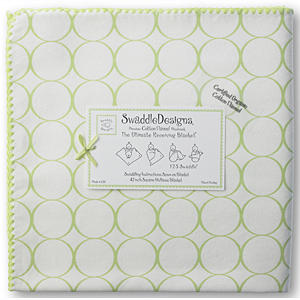 Beautiful color circles with swaddling instructions are sewn into the edge of every blanket. This super soft swaddler can be used as an all around blankie that can be conveniently rolled to fit into a diaper bag. The blanket is 100% organic cotton, sized 42" x 42" and completely machine washable! The blanket retails for $32. This blanket is SO soft and super cute. G's baby looks completely adorable all swaddled up in it:) Happy baby = happy momma! Wild Dill is such an incredible store as they carry only natural, organic, fair trade, made in the USA/Europe, or recycled clothing, toys, bedding and furniture for babies and toddlers. Rest assured the items you buy from Wild Dill are quality made! *Wild Dill donated the Mod Circles blanket in exchange for an honest, truthful review. All opinions are my own and no money was exchanged. Thank you, Wild Dill, for being an awesome company!